April is National Poetry Month and one of the prizes it holds is Poem in Your Pocket Day on April 18. Since 2003 New York City has celebrated the day every year with activities in schools and cultural organizations. In 2008 the Academy of American Poets extended the program nationally, and since then many other cities have instituted their own annual celebrations. Poetry. As we say in New York City, what's not to like? I'll be carrying two poems in my pocket: "The Second Coming" by William Butler Yeats, which seems almost too appropriate this year, and a wonderful Wendell Berry poem, "The Real Work". What poem will you carry? My niece Heather has chosen her pocket-sized poem: "Still Here" by Langston Hughes. Another friend, Win, has chosen William Cullen Bryant's "Thanatopsis" – which could require a deep pocket. 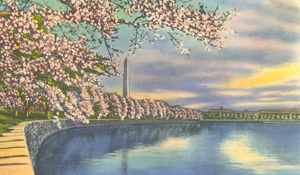 If you need ideas, visit the Academy of American Poets' Poem in Your Pocket Day site. Also, do yourself a favor and download the Poetry Foundation's fabulous poetry app – you'll be able to carry hundreds of poems in your pocket every day. 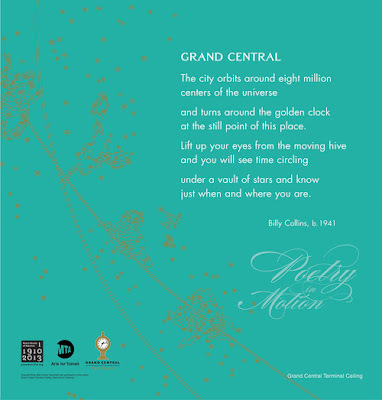 New Yorkers can check out our city's Poem in Your Pocket Day activities here. On April 10 in Grand Central Terminal's beautiful Vanderbilt Hall, where the acoustics are so good that every musician should have a chance to play there, the Poetry Society of America and the NYC MTA's Arts for Transit program put on an absolutely terrific show – for free – to celebrate 100 years of Grand Central. The event drew a good-sized crowd for a weekday evening, but since most people missed it, I'm going to recreate some of it for you. First a friendly warning: If you're in a hurry, you won't have time to read this. The Yaz Band opened the evening. I missed their performance, but they're familiar from the MTA's Music Under New York program. Here they are playing in Penn Station. The evening's first poet was Jeffrey Yang. 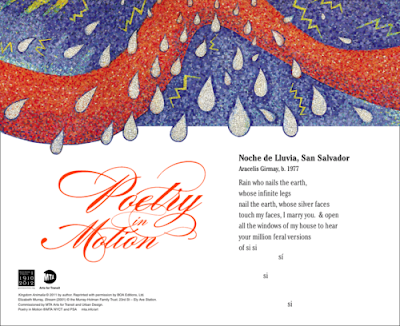 He did not read this poem, but he might have – it's one he did for the city's recently revived Poetry in Motion program of poetry on mass transit. Aracelis Girmay was the next poet to read. 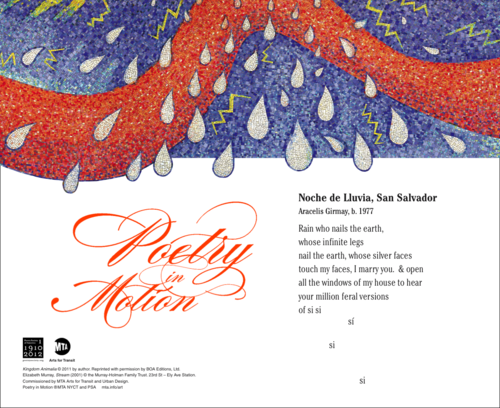 This is not one of the poems she chose – I couldn't find those – but here is her poem for Poetry in Motion, "Noche de Lluvia, San Salvador". The miraculous all-female Mariachi Flor de Toloache stepped on the stage like a convocation of horn-tooting, fiddle-playing, guitar-strumming, vocalizing queens. I love mariachi music anywhere, anytime, but these women were outstanding. But why tell you about them when you can watch the performance I saw right here? Poet Eduardo C. Corral spoke about his father, a hard-working immigrant sans visa, before reading this poem. The next poet, Bob Holman, is a champion of poetry spoken and performed. Here he is at Fordham University. Salieu Suso is a kora player from The Gambia. I see him often on my way to work in the morning and always stop to listen to his beautiful, haunting music. In fact, I saw him playing in the Times Square station the morning after he played at Grand Central and told him so; he seemed pleased. Watch him sing and play here. Marie Howe read next. When she introduced this poem, she said she had written it about her daughter, now 12, when she was four. She realized she was always telling her little one to hurry and began to question it. Poem copyright ©2008 by Marie Howe, and reprinted from "When She Named Fire," ed., Andrea Hollander Budy, Autumn House Press, 2009. Billy Collins topped the poetry bill. That's his new poem for Poetry in Motion above. He spoke about his lifelong relationship with Grand Central – his father commuted via the terminal daily and the family passed through on visits. And then he read this wonderful poem, "The Death of The Hat". everyone in the street was wearing a hat. The evening ended with a performance by Hot Sardines, and they were hot indeed. This video will give you a sense of what they're like, but for the Grand Central performance they added a tap dancer – très chaud! For National Poetry Month, I'm sharing a poem by Sharon Olds. It's from her most recent collection, Stag's Leap, a magnificent book that tells the story of the end of her thirty-two year marriage. Her poems record her shock and grief and doubt and rage at her husband (who left her for another woman) and herself with such searing honesty that I literally winced when reading some of them. Eventually, she starts to heal herself. But she is changed. This poem is from the first half of Stag's Leap, where she is still quite raw and flooded by thoughts of what was. You can see Sharon Olds read her poem in this PBS interview. One more thing: Don't forget to celebrate Poem in Your Pocket Day on April 18th!